Please join me at the 35th Annual Austin Music Awards. I am happy to host and manage the “Louis&Nick Lounge” ths year in our new venue. It might just be the best show yet! Stay tuned and buy your tickets today! 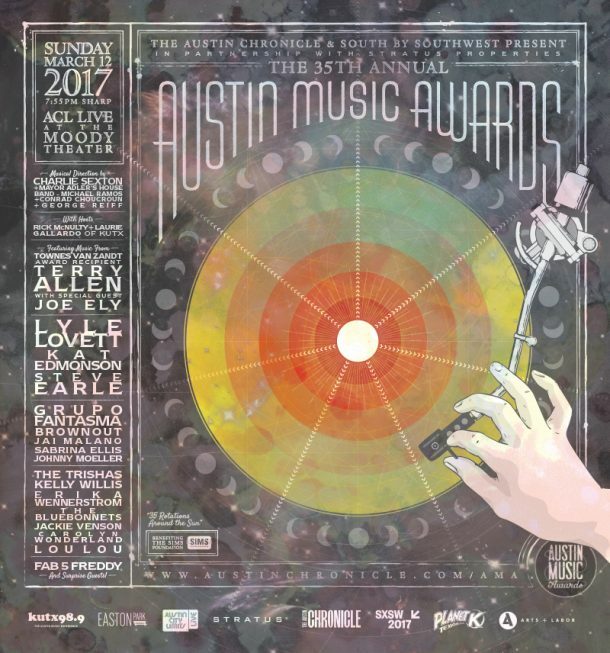 The Austin Chronicle, SXSW, and Stratus Properties at the Moody Theater are proud to present the 35th annual Austin Music Awards on Sunday, March 12, 2017 at ACL Live at the Moody Theater, with proceeds benefiting the SIMS Foundation. With a new date and new venue for 2017, the Austin Music Awards will continue in the hallowed tradition of celebrating winners from the Austin Chronicle Music Poll while continuing to be a unique and innovative force on Austin’s music scene. New this year, the Mayor’s Office will proudly support the Austin Music Awards by sponsoring the AMA artists along with the new “Mayor’s House Band” – led by returning Music Director Charlie Sexton. Stay tuned for lineup announcements here and on our Facebook event! Thanks to SXSW, Arts + Labor, KUTX, Stratus Properties, and the SIMS Foundation.